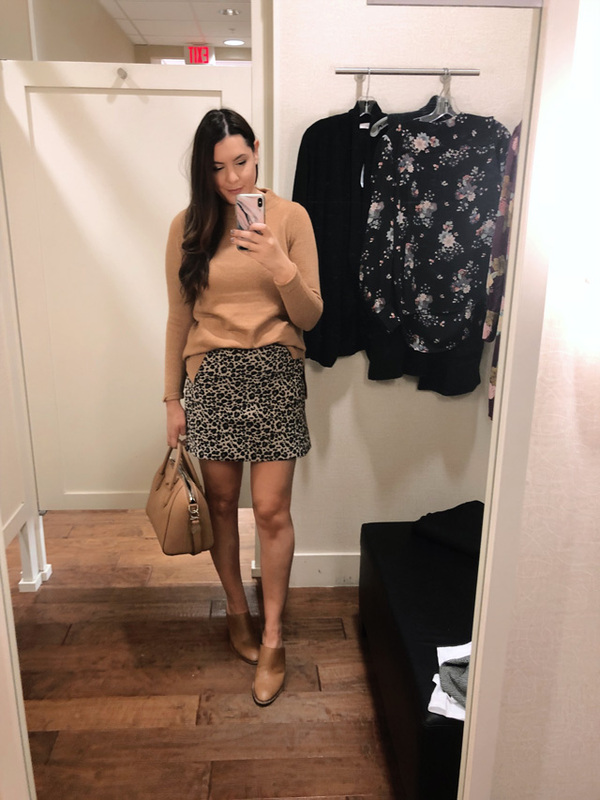 Dressing Room Diaries: Loft Friends & Family Sale! 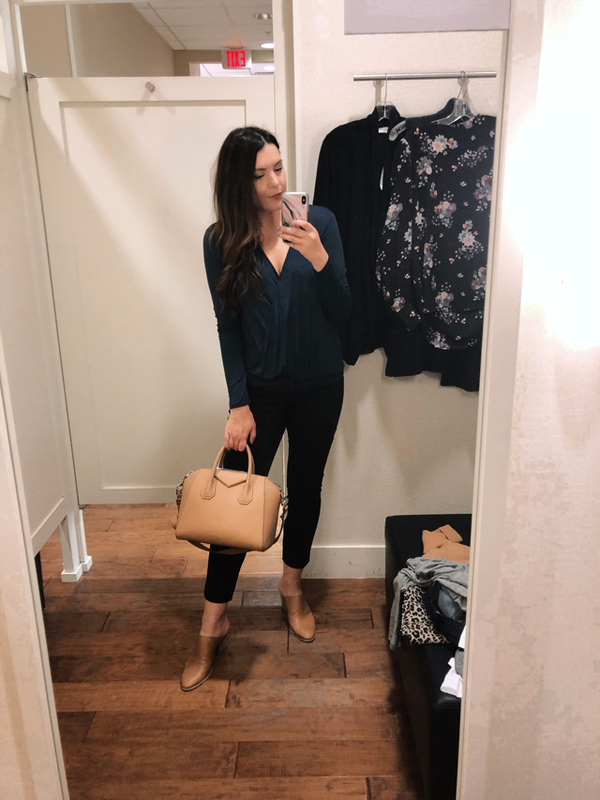 Besides the Nordstrom Anniversary Sale in the summer, I typically don’t ever do dressing room diaries but the weird thing is I love when others do them. So when I saw that this weekend is Loft’s Friends & Family Sale, I hightailed it to my closest Loft to try on! Here is what I tried on, how everything fit and scroll to the end to find out what I ended up keeping! This is their best sale — everything is 40% off including Lou & Grey AND you can use your LOFT cash! You can find the full sale here. 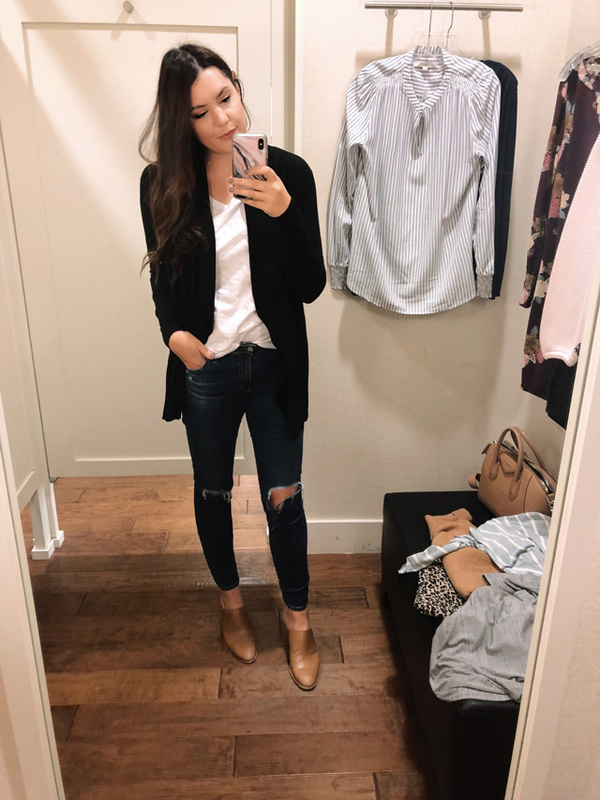 Drapey Open Cardigan: I really liked this cardigan! I’m kicking myself for not keeping it, but I might order it online this weekend. It’s the perfect black cardigan, it’s drapey and I feel like that’s what makes it different than just a boring cardigan. It fits true to size and pretty fitted too. I thought it would fit looser but it was perfect. I’m in the medium. Elbow Sleeve Tee: I did not end up keeping but it fits true to size. I would probably size up because I like tees to be looser on my bust, but it is a TTS fit. Striped Smocked Cuff Blouse: This top had a very Madewell vibe to it and I loved it. It’s just a cute and simple top. It fit me perfectly, I am in the medium here. 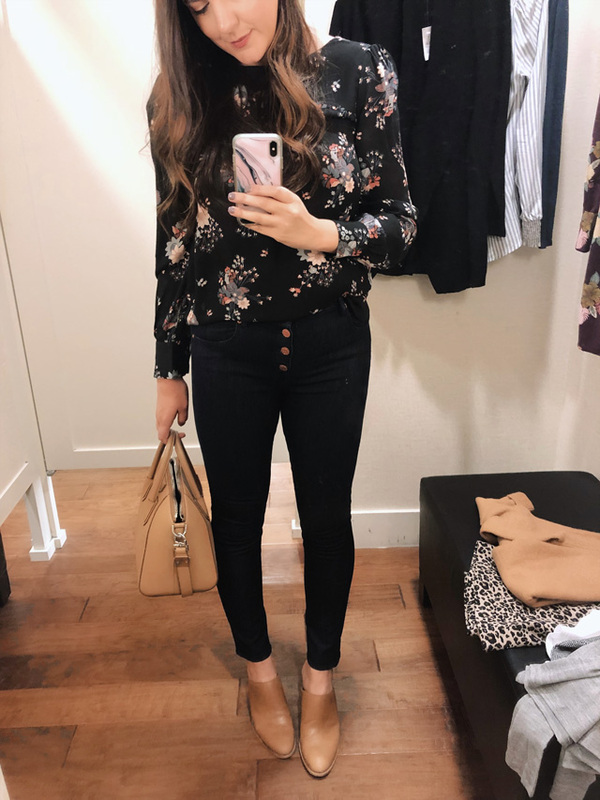 I feel like if you are tall, it’s a great fit but if you are petite, try for the petite sizing because the sleeves were long and usually I can never find blouses TTS that have long enough sleeves. Find it here. Bouquet Cutout Back Blouse: I love love loved this blouse in person. I am always a sucker for florals, so yeah no-brainer here. I loved the silky feel of the fabric and like the second I put it on I was like, let’s go. You know when you want to just change into the new outfit that you put on in the dressing room? It was hands down this outfit. But then I called total BS when I went online to link it because the photos do not do this pretty top justice! It’s seriously so much better in person. It’s so romantic and pretty, the perfect date night top! (Even if our dates start at like 4 pm sometimes lol) You can find this top here! 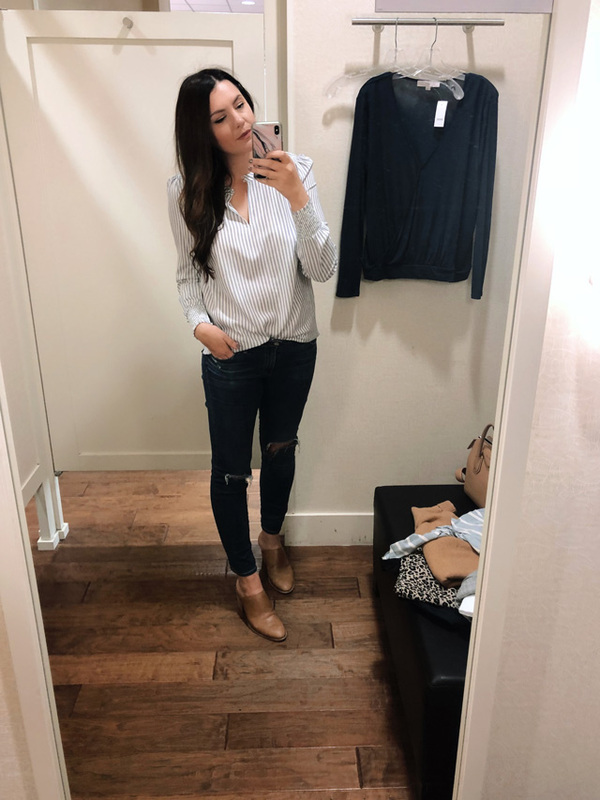 Modern Button Fly Skinny Jeans: So I’ve been seeing jeans like this on my girl, Anna, and I just haven’t looked for them myself. As soon as I walked into the door at LOFT these jeans were right there, in my size, just calling my name. Someone in the reviews said they run large but I didn’t find that to be true at all. Very true to size. I am in the size 8, which is my typical size in denim at the LOFT. They are a bit more fitted in the tummy, but that’s where I carry more weight so I would say these fit TTS. You can find this pair of denim here. Also how amazing does it look with this top? RIGHT??? Meant to be together. 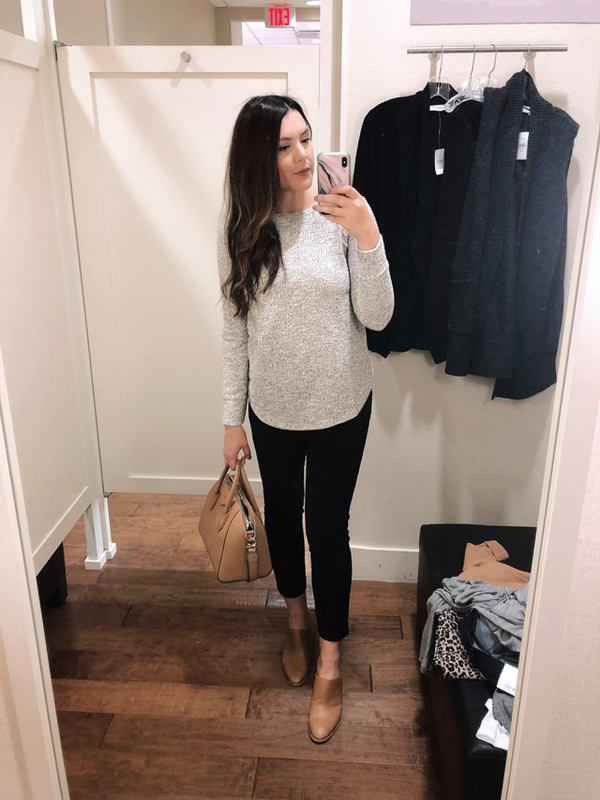 Mock Neck Tunic Sweater: If I had to tell you to buy one thing from this sale, it’s this sweater 100%. I have a camel sweater from VINCE from a few years ago that I have worn and worn and worn and worn. (Fun fact: it was the sweater I was wearing when we first heard Gemma’s heartbeat!) 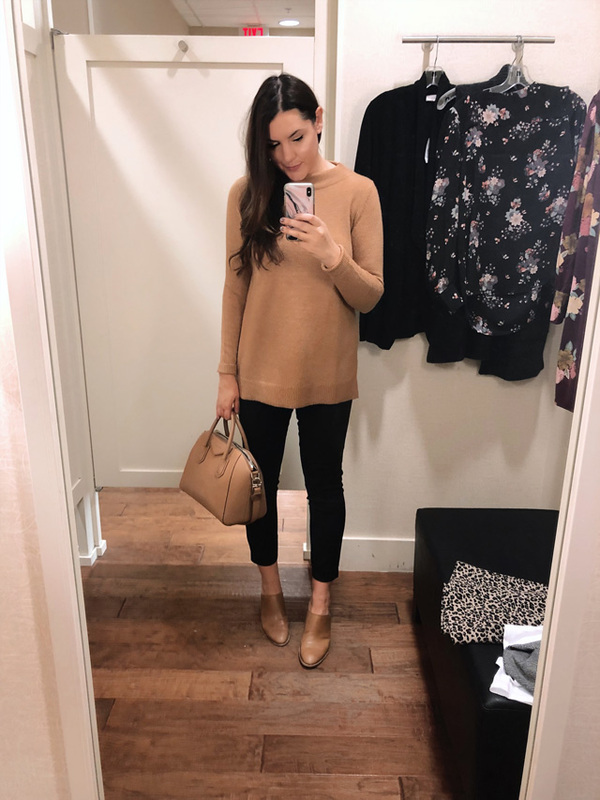 But since then, I’ve not seen a ton of camel sweaters around to link as similar and I’ve always thought what a shame because this is seriously one of the easiest colors to toss on and instantly feel classic and pulled together. I walked in and this one was a no-brainer for me. This fits true to size, I’m in the medium. It’s a bit different than my other sweater as it’s more a tunic length and not a full turtleneck, so I justified it to buy it 😉 You can find this sweater here! 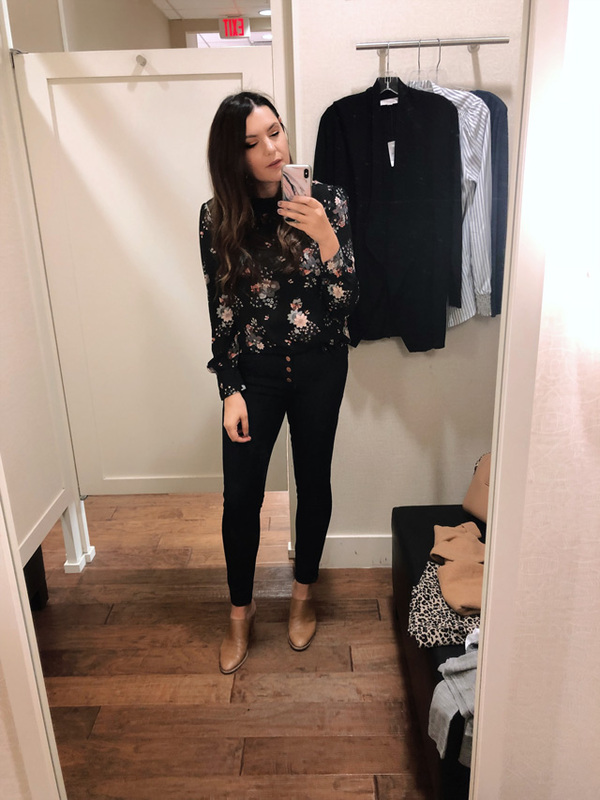 Slim Pencil Pants: Do you ever go into your closet and think I just need a nice pair of black pants? I have been saying that lately and LOFT is delivering with these. They fit true to size and oh so nice! I am in the 8s, the Julie fit. You can find them here! Leopard Jacquard Pocket Skirt: This skirt is so freaking darling you guys. I put it on and instantly was like ‘oh, you fancy huh?’ I just wished I was a lady who lunched. I found it to be a bit snug but TTS. It’s a thick, stretchy knit fabric so it’s pretty forgiving. I am in the 8! You can find this skirt here. Boucle Tunic Sweatshirt: Um yes x 100 to this sweatshirt! It’s amazing, you can dress it up or down. (I would consider this outfit dressed up, no??) It’s soft but it keeps its shape. It fits true to size, although I found the arms/shoulders to be a bit tight. I stayed TTS in the medium, but just as a caveat. You can find this top here! Wrap Long Sleeve Tee: This top is so soft and it’s perfect if you’re nursing! I will say it’s a little low on me and I’ll most likely wear a camisole under it, but it’s a really pretty color and I love the weight of this knit. I am in the medium and it fits generously, but TTS. You can find this top here! 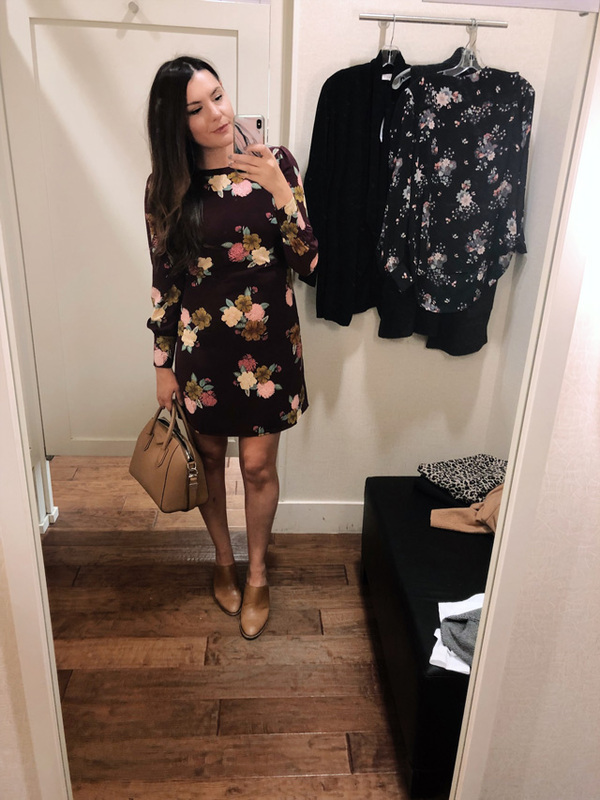 Floral Cuffed Shift Dress: I SO wanted to love this dress. The color is just gorgeous and you know my affinity towards fall florals. But y’all, it just didn’t work on me. I think if you have a smaller bust (I’m 34D) then it would work really well. It just kind of clung to my chest and never really fit like a shift dress. I sized up and it just looked too big. So wah-wah this dress was a no-go for me but was a beautiful print, it just wasn’t for my body type. 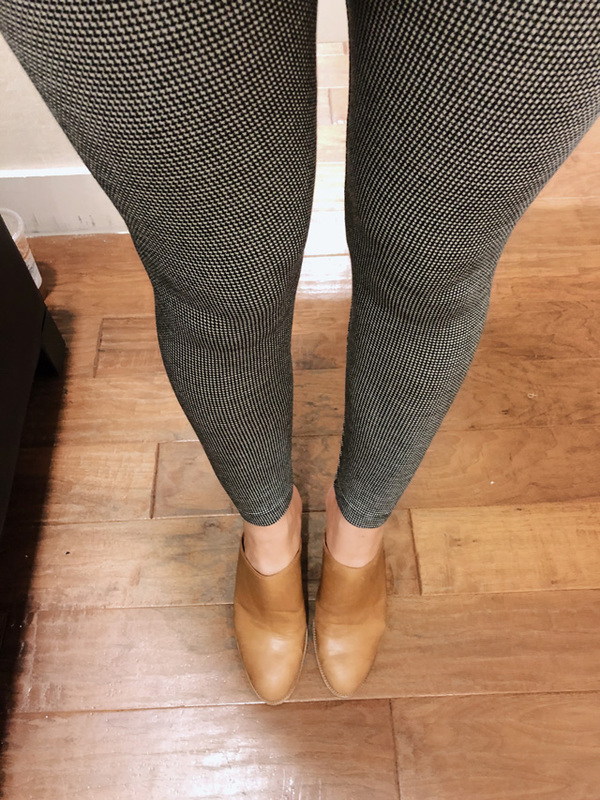 Lou & Grey Houndstooth Leggings: I took a chance on these and so glad I did! I couldn’t decide between these and the herringbone and I liked these more in person and the herringbone online. Go figure. I am in the medium and they fit true to size! 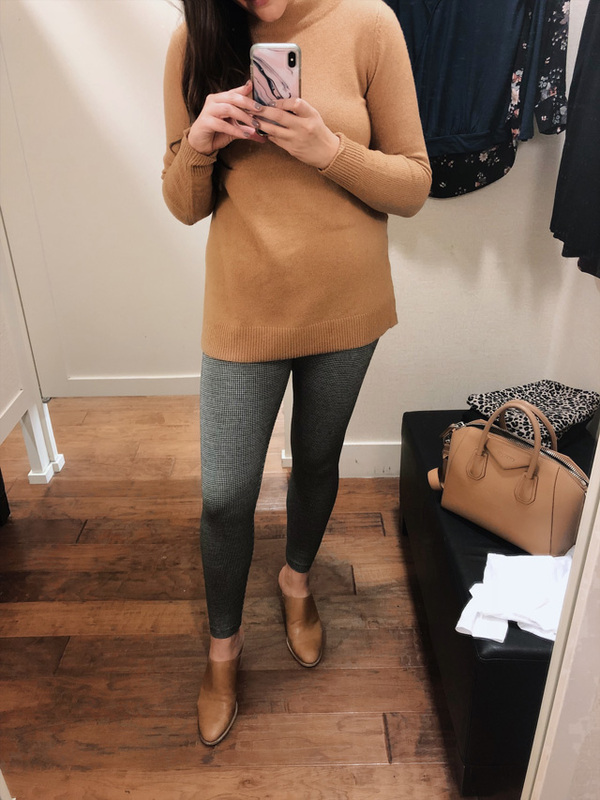 I will probably always pair with a longer top or tunic just because they don’t have a super cute waistline (it’s like a typical legging) but this camel sweater tunic is perfect for it. So I’m sold! Don’t you just love a sale in the fall? Me too 🙂 So from now until this Sunday, you can save 40% off your purchase at LOFT! You have sign up for their emails for the code but you can find all of that info here! Happy shopping! All fit details in the post! It’s been awhile since I’ve been to Loft! This post definitely makes me want to go and shop. Plus, there’s a sale! Thank you for doing this try on session! I love your opinion on these items. You look beautiful in everything! loving the pieces you got! I was so excited to see you do a Loft try on session! Added a few things to my cart that I would have otherwise overlooked. Thanks! You should definitely do more dressing room diaries! love those shoes – where are they from?